With their ground-breaking full-frame 5D nearly three years old, the replacement for the model that created a new market segment has been expected at every photo event for the past year or more. Canon has certainly played this excitement to the hilt, including a clever web teaser that showed a little more detail every few days. To their credit, Canon managed to keep the final details about as secret as we have ever seen in this market. Now, with just a few days until Photokina begins, Canon has finally announced the Canon 5D replacement, to be called the 5D Mark II. Among the many advancements in Canon’s new EOS 5D Mark II camera is the Company’s proprietary DIGIC 4 Imaging Processor that powers the camera’s fast 14-bit analog-to-digital conversion for smooth color tones and exceptional gradation. 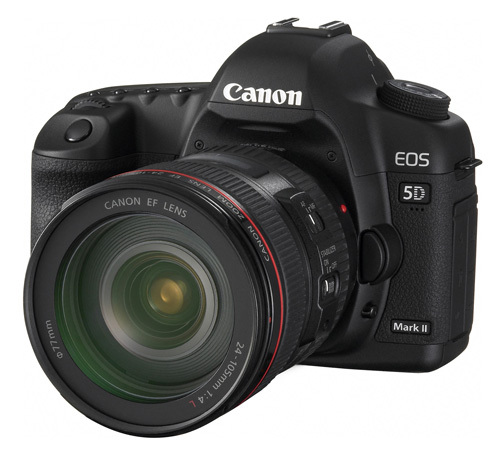 The Canon EOS 5D Mark II Digital SLR offers a full-frame 24 x 36mm, 21.1 megapixel CMOS sensor and continuous shooting at 3.9 frames per second (fps) for an unlimited number of full-resolution JPEGs to the capacity of the memory card or up to 14 RAW images in a single burst when using a UDMA CF card. The camera includes a 15-point Autofocus (AF) sensor with nine selectable AF points plus six additional Assist AF points (three center AF points sensitive to f/2.8 lenses) with enhanced light source detection and AF microadjustment for greater autofocus performance. 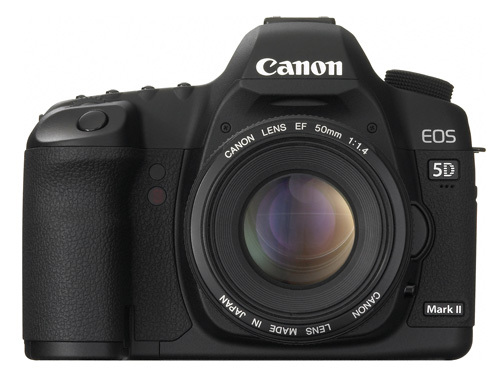 The EOS 5D Mark II camera also features a large, clear 3.0-inch Clear View LCD screen with 920,000 dot/VGA resolution, four times the pixel count of the EOS 5D camera’s 2.5-inch screen, for enhanced clarity and color when viewing images. The new camera is equipped with a high-performance, high-magnification optical viewfinder providing 98 percent coverage, giving a new dimension to the saying, “what you see is what you get.” Professional photographers will also appreciate the enhanced 150,000-cycle shutter durability of the EOS 5D Mark II camera. The EOS 5D Mark II will record video up to 4GB per clip or a maximum continuous movie capture time of 29 minutes and 59 seconds, whichever comes first. Depending on the level of detail in the scene, a 4GB memory card can record approximately 12 minutes of video at full HD resolution or approximately 24 minutes in standard definition. The camera includes an HDMI (High-Definition Multimedia Interface) output to display crisp, clear images on a High-Definition TV. Video clips are recorded in .MOV format using an MPEG-4 video compression and sound is recorded using linear PCM without compression. The new camera features an input terminal for external stereo microphones as well as a built-in monaural microphone for convenience. The Canon EOS 5D Mark II Digital SLR camera is compatible with Canon EF lenses and is scheduled for delivery by the end of November. 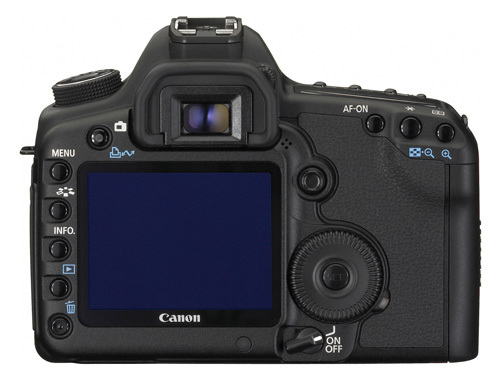 The EOS 5D Mark II will be sold in a body-only configuration at an estimated retail price of $2,699. It will additionally be offered in a kit version with Canon’s EF 24-105mm f/4L IS USM zoom lens at an estimated retail price of $3,499. The new EF 24mm f/1.4L II USM lens is the successor to Canon’s EF 24mm f/1.4L USM professional wide-angle lens released in 1997. Targeting professional photographers, the new EF 24mm f/1.4L II USM lens has been introduced to address the advancements high-resolution digital SLR cameras with re-designed optics and use of a new anti-reflection lens coating called SWC (Sub-Wavelength Structure Coating) to minimize ghosting and flare. Features such as dustproof and waterproof construction that have been adopted make this a high-performance lens with specifications that respond to the demands of professional users. A welcome complement to the EOS 5D Mark II Digital SLR camera, the EF 24mm f/1.4L II USM lens is scheduled to be in stores this December at an estimated retail price of $1,699. Canon already has a 24 to 104 IS "L" lens. They also have a 17 to 85, but it's for the APS "C" cameras, and none of the APS lenses are "L" lenses, because as Canon says, that's reserved for the full frame lines top models. But the gold ringed lenses are pretty good. I guess im phychic. When they reviewed the new Sony DSLR, i critisized it while others said how great it was and how awesome it is for under 3 grand. And I said Cannon and Nikon are going to beat the crap out of it becuse they are the top two in the DSLR markey and make QUALITY over trash becuse Sony and others are after market share. 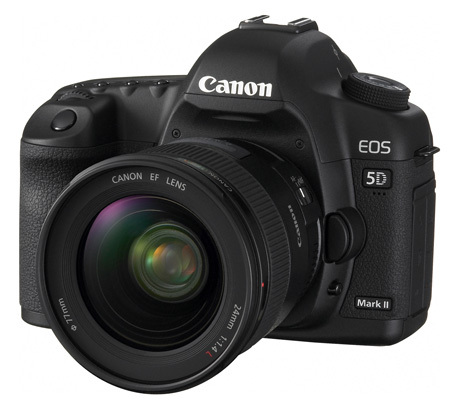 5D mkII is more geared towards landscapes and general photography with more detailed required. What people aren't commenting on here is the question, and it's been brought up in the pro sites, is how good the sensor really is. From what I know, the 1Ds has better noise than the A900 at higher ISO's, from 400 and up, at least. As the 5D mkII is supposed to be about 1.5 stops less noisy at any ISO than the older 5D, which already was less noisy than the 1Ds mkIII, it should certainly be interesting. Personally, I think Sony made a mistake going for the gold on resolution, rather than overall IQ as Nikon did. The difference is insignificant. This could bite them if the 5D mkII is as good as Canon is saying it is, and the few photographers who have been using it already have been saying. The 5D was never aimed at the sports photographer. Some people think that sports is the beginning and the end. But most photographers do not shoot sports. When this camera came out, the IQ was higher than any other camera around, including Canon's 1Ds, if you don't just take resolution into account. And even there, it wasn't that much lower than the 16.7 MP of the 1Ds mkII. I find that even now, at ISO 200 the camera easily holds its own against Nikons D3 and D700. That's saying something for a three year old body. The new one will do better. Most people using these cameras won't be shooting at 25,600 ISO, or even 12,800 ISO. both are useful, but neither gives much in the way of quality. The battle will be in dynamic range at lower ISO's. We'll see what happens there.